As I do more research into various periods of historic costume I find myself having a more and more difficult time properly trimming various garments. Sure there are places that sell historic trims, but how often are those going to match what I’m making? Many historic trims were made from the same fabric (or contrast fabric) as the garment they went on. My search into historic trims led me to fabric manipulation and to ribbon trims for hats. Many of the techniques are related. I just got a reprint of an old book on hat trims and this is my first attempt. It’s a ribbon cockade that goes on a hat or is for a dress decoration in the 30s/40s. I made it with a thinner that usual grosgrain ribbon I had on hand that is about 3/4″ wide. I’d say I used about a yard. The technique involved folding the ribbon into a continuous strip of triangles and tracking the selvedge, not unlike making ribbon roses as a kid. A final trim would have a button in the center and maybe another layer of trim under this one. Should you find yourself looking for 1930s sewing patterns, I highly suggest checking out the excellent New Vintage Lady. She specializes in patterns for the Stout (plus sized) lady for primarily 1930s and 1940s. You can find her patterns for download on Etsy. 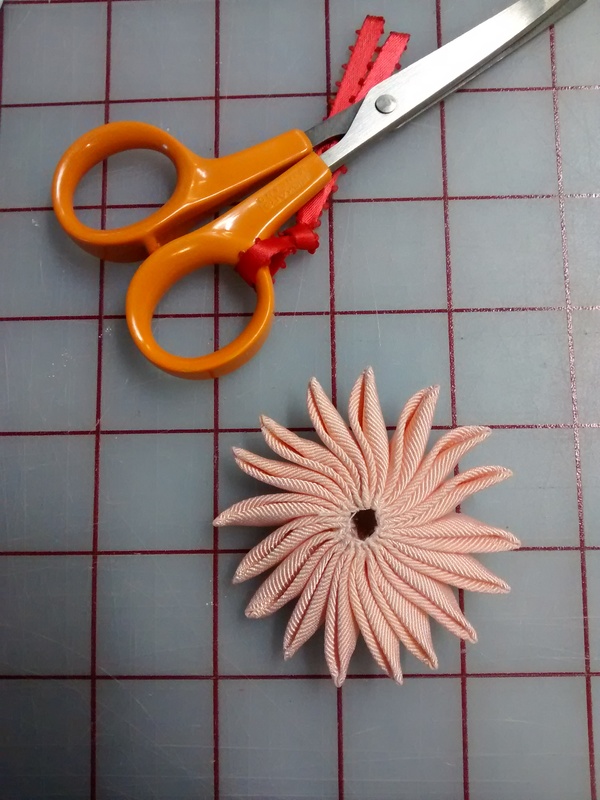 Here is her blog, which includes info about her patterns, vintage advertisements and catalog pages, historic photos and her adventures in sewing. A lady after my own heart. 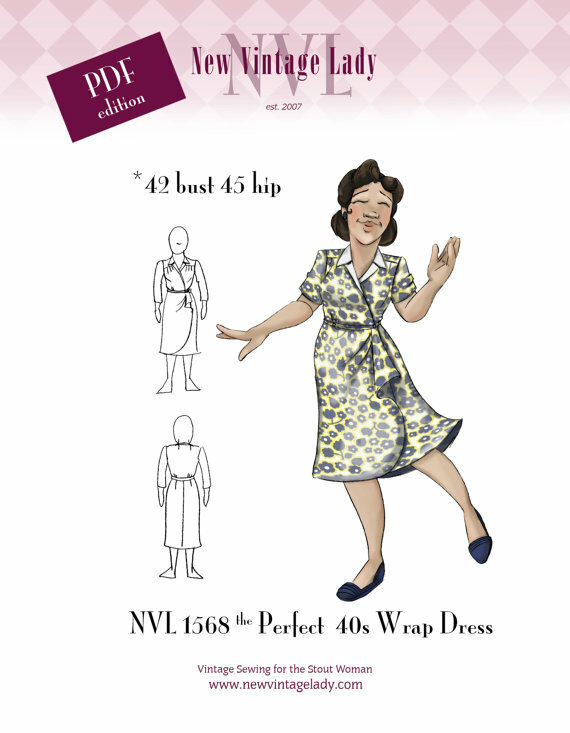 I’m still making my way through her blog, but she has lots of great info, including vintage dos and don’ts for the plus sized figure and a primer on how to read vintage patterns. Did I mention that she illustrates all her own patterns and has an indy comic, Vintageville? I love her illustrations! You can also follow her on Pinterest and all over the internets. Enjoy! Update: Here is the Alameda Vintage Fashion Faire’s blog. The next event after June is Nov 14-15, 2014. Coming up this weekend is the Alameda Point Vintage Fashion Faire, Friday and Saturday, June 13th and 14th at Michaan’s Annex Auction Showroom, 2701 Monarch Way, Alameda, CA. Produced twice a year by Sandra Gordon Michaan, who also co-founded and runs the popular Alameda Point Antique Faire, this is more than just selling vintage fashion treasures, it’s a happening. The theme this time around is 1940s/WWII/USO and on Friday evening, 6pm to 9pm there will be a vintage fashion contest. First prize is a $100 voucher to shop the show. Plus enjoy food and a no-host bar, and live entertainment by Tin Cup Serenade featuring singer Emily Ann Reed. Fifty dealers will be selling items from the Victorian era right up to the 1990s (I guess that’s vintage now). Please note that Friday evening is 21 and over only. Saturday is the big shopping day but the theme continues for anyone wanting to dress in their 40s best. Or any era or even better, get creative and mix it up. Dealers include my pals Barbara Grigg from Vintage Vogue and Jula and Roberto from City Vintage. The Alameda Point Fashion Faire – Friday, June 13, 6pm-9pm and Saturday, June 14th 11am-5pm. Ten dollars on Friday, which includes reentry on Saturday. Five dollars on Saturday. Michaan’s Annex Auction Showroom, 2701 Monarch Way, Alameda, CA.